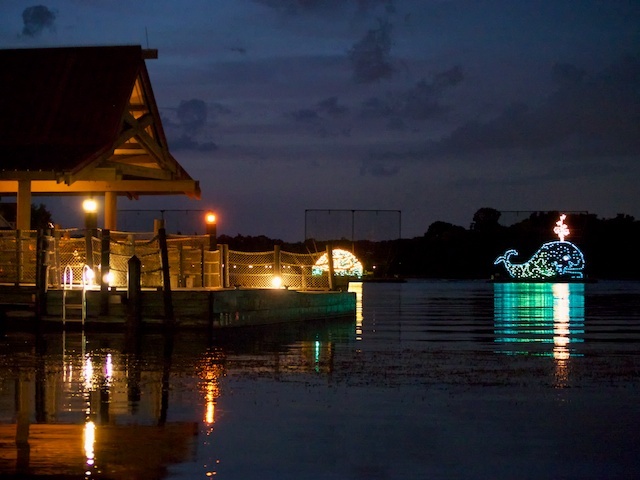 When Disney Imagineer Bob Jani looked out over Seven Seas Lagoon at night he saw a black gulf, void of interest. It was late 1971 and Magic Kingdom, Polynesian Resort, and Contemporary Resort opened soon. The lifeless lagoon, formed from draining the swamp that dominated the land Magic Kingdom occupies, would presently be filled by ferries and water attractions, including a water ski show. But something was missing. His mind turned to his hometown of Los Angeles, where any body of water reflected myriad lights every night. Somewhere this need to fill the dark with twinkling lights sparked the idea of the Electrical Water Pageant: a train of barges sporting colorful animated lights. The final float in the aquatic scene. A brochure given to guests in the Summer of 1972 entices the guest to “watch porpoises leap . . . seals play . 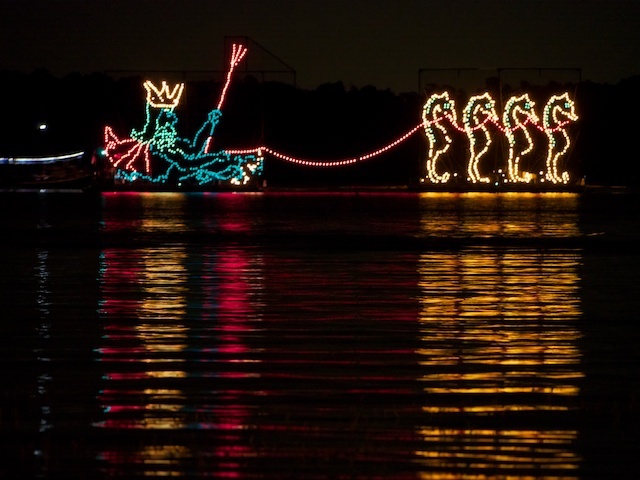 . . even a sea monster breathe fire!” Guests were directed to see the Pageant nightly 9:00 PM through 10:00 PM along Bay Lake and the Seven Seas Lagoon, advice that is still good today. The whimsical attraction’s appeal eventually inspired the Main Street Electrical Parade — even copping the song “Baroque Hoedown” as its theme. 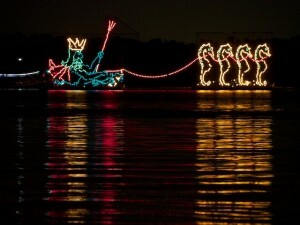 Today the Pageant is one thousand feet long and features 25-foot tall screens on fourteen barges. 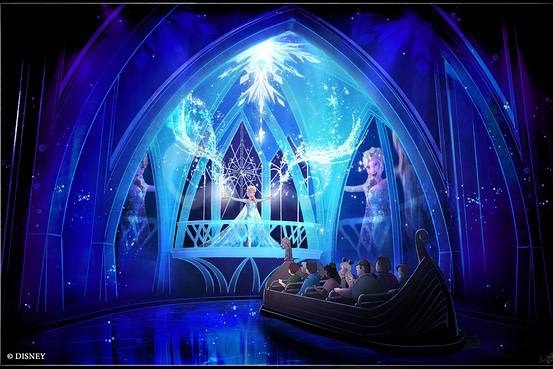 The show is split into two parts: an aquatic theme featuring King Triton and various sea creatures followed by a patriotic salute. Total time, nose to tail, is about ten minutes. Due to the nature of the show, the times are approximate for all but the first stop, with later shows tending to have accumulating delays of several minutes. I tried to make sense of the path of the barges on a map, but geographically the order does not make sense. If anyone knows the reason for the strange order, please let me know. Viewing locations are from the beach behind the Volcano Pool and along the boat pier. When the new cabins over the water open, there will be a view from the rooms. When the Nanea Volcano Pool closes in late July, beach viewing might be blocked. This is one of my favorite spots to view the Pageant because it floats by instead of staying stationary like some of the other places. It’s also much closer to you here than in any of the other locations. But the popularity of the pool and beach means it’s often crowded. In the summer months with long days, the sky is still dark blue, which can enhance any photos you take. Despite that, if you are taking photos of the floats, this probably is not the best location since the combination of low light and moving subjects is technically challenging. View of Narcoossee’s during the Electrical Water Pageant showing the viewing verandah. The viewing location at Grand Floridian is a hike from the monorail and main entrances. There also isn’t a good place to sit down, as the primary viewing location is from the boat pier and the beach. The Pageant is stationary here, going through its stages without moving. This somewhat ruins the feel of the show since motion is implied by the figures of the sea serpent and Neptune’s chariot. This is a good location if you are dining at Narcoossee’s since you can leave your table and watch from the verandah in the back of the restaurant. Wilderness Lodge and Fort Wilderness Resort are both good locations to see the Pageant if you happen to already be over there for dinner or lodging. These are the only two locations not on the Monorail Loop, and it is probably not worth the trip out there just for the ten minute show. 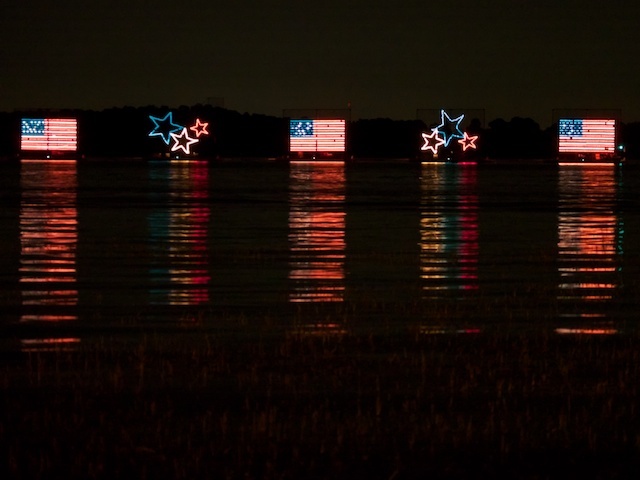 See the show from the beach or either boat launch. You can get some interesting pictures of the Pageant in the background of the Fire Rock Geyser, but it isn’t the best location for viewing. 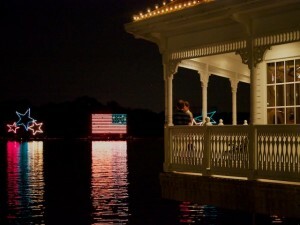 Viewable from the near the volleyball area and the Fort Wilderness Marina. With the winding roads and large area of this resort, this is only a convenient location if you are staying at the resort or campgrounds. 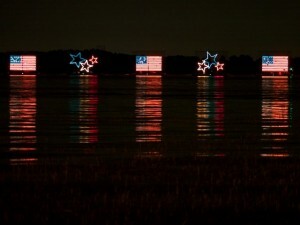 The portion of the Pageant displaying the Stars and Stripes. From Contemporary Resort beach. The best viewing area here is the beach. You can also see it from the boat pier, but it isn’t at an ideal angle. Because of the later time and remoteness of the Contemporary beach, this is one of the best places to view the Pageant if you want to do so privately. For these reasons, and because this is another location the boats are stationary, this is the ideal place to take photos of the show. Arrive early, grab a drink “to go” at The Wave bar, and enjoy. Viewable from the front of Magic Kingdom outside of the bag check. This is the least reliable location to view the Pageant. The official site mentions it only runs during Extra Magic Hours, but I have personally seen it during late summer park hours. There is not a great place to stand and watch, and on a busy night there will be a lot of pressure to keep moving anywhere near the front gate. However, it is a pleasant background to park egress if you can time it right. You’ll also see it if you correctly time a ferry ride back to the Transportation and Ticket Center. Note that if Magic Kingdom has 9:00 PM fireworks, the Pageant will be delayed 10 to 20 minutes at all locations. Hi Scott! Just a quick addendum – you can also see the pageant from the monorail queue ramps (I believe it’s the resort line…the one furthest from the MK entrance). This is an elevated view, and the sound does carry – but obviously, you’ll probably only see a few minutes before the next train comes along and you move up the ramp. Still…helps pass the time. Thanks RickG! That seems to be the case with most of Magic Kingdom’s viewing spots. “Okay folks move along.” But it is a nice backdrop for queuing. We were fortunate to get a close look during a Backstage Magic Tour and as the Cast Member described it, the EWP is just about as low-tech as it gets, at least at WDW. Thank you for fine research and giving this very special show its own blog. Don’t forget about viewing the parade while enjoying the Pirates Fireworks Cruise! Best way to see Wishes, IMHO, and the parade is a nice bonus. I have seen it from our balcony at The Contemporary (great view!) from both the Bay Lake side and the Seven Seas Lagoon side. I am not sure what the times are for the Seven Seas Lagoon side? Interesting. I didn’t know the show would be lit on that side; they turn it off in between stops. If I had to guess it would probably be between the times shown for Contemporary and Magic Kingdom since it’s probably on its way to the park. So 10:20PM-ish?